Tricia M. Pride practices in the area of labor and employment law with particular emphasis in the area of employment litigation, including wage and hour, Americans with Disability Act issues, and workers’ compensation defense. 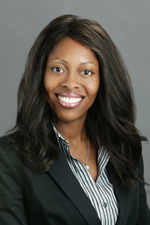 She provides both counseling and litigation services to public and private companies. Ms. Pride's experience includes managing a case from inception to conclusion, handling depositions, hearings and trials, with numerous take nothing defense verdicts. She is also a master negotiator specializing in alternative dispute resolution, for which she has obtained a Master's Degree. She also defends 132(a) discrimination and serious and willful claims. In addition, she litigates general liability and personal injury claims. Ms. Pride joined Hinshaw & Culbertson LLP in January 2010. Previously she was an associate counsel for a finance company in Boynton Beach, Florida. Ms. Pride began her legal career in 2005 as an associate at Johnson, Schachter & Lewis, in Sacramento, California, where she focused her practice in insurance litigation. She was also an associate at Hanna, Brophy, MacLean, McAleer & Jensen, LLP, where she handled workers’ compensation claims. She was previously a law clerk with Brayton Purcell, in Novato, California, where she worked in their toxic tort litigation department. In addition to her other law school achievements, Ms. Pride was a quarter finalist winner in the Dalsimer Moot Court Competition. She also participated in the Jessup International Moot Court Competition in 2000 and was selected as Best Oral Advocate in the Sonnenberg Moot Court Competition in 2001. Ms. Pride was the recipient of the Dispute Resolution Fellowship, for outstanding achievement in dispute resolution, and was invited to join Pepperdine’s Trial Team. In addition, Ms. Pride was the President of the Black Law Student Association. She also participated as a mediator in both the Malibu, California and Van Nuys, California courthouses through Pepperdine’s Dispute Resolution Clinic. Tricia is married and divides her time between California and her home in Florida.